Annette was diagnosed with rectal cancer in 2016. 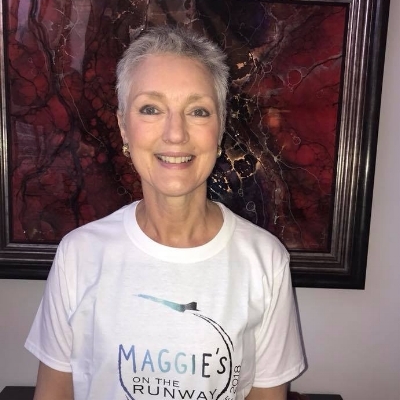 "I feel privileged to to be part of the Maggie's on the Runway family and very honoured that I have made so many beautiful and courageous friends. Knowing that I 'm not facing cancer alone is one less stress to worry about in my darkest moments. I would feel lost without Maggie's"
Last year Helen underwent a Whipples procedure to remove a tumor in her pancreas. "My friend nominated me...it isn't something that I would normally do but i am determined to try new things and not to say no to new experiences." Jane's breat cancer returned in her lymph nodes and she is now on a permanent course of immunotherapy to keep it at bay. "It's tough the second time around but I have a fantastic support team keeping me going and I am determined to make every day count." 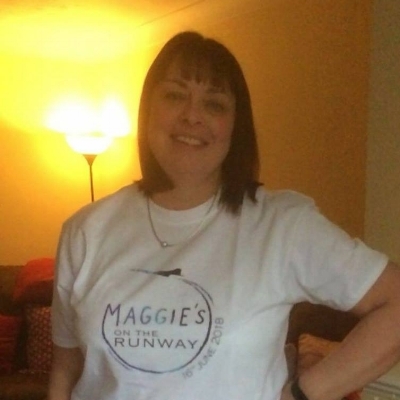 Jane attended Maggie's on the Runway as a guest in 2016 and was amazed at the wonderful work that the Maggie's Centres do to support cancer patients and their families. A couple of months later, Jane herself was diagnosed with breast cancer and she started her own cancer journey. "Having worked at the Christie Hospital as a young nurse, I could see there was a need for a place like Maggie's. It was hard to be the patient this time but Maggie's gave me the support and the calm that I needed." Janet's world turned upside down in 2012 when she was diagnosed with ovarian cancer. Fast forward to 2018, Janet is now living with a secondary cancer in her peritoneum . "I discovered I had the BRCA1 gene mutation and consequently my family had genetic testing. Since then two other family members have been diagnosed with ovarian cancer. I am now receiving a maintenance drug and happily beating the odds, in fact, I am living very well with cancer." Following a diagnosis of breast cancer, Judy had a double mastectomy . "I couldn't change the fact that I had cancer and whilst you are involved in treatment decisions to an extent , there is a sense that you are not totally in control. The one thing that I could control was my attitude. I could sink or swim - and I chose to swim ( and not just doggy paddle!). Maggie's has provided great support not just to me but also for my family." Karen's felt as if her life was on pause for 6 years after her breast cancer diagnosis. Now off treatment, Karen is starting to get her life back.
" When I was diagnosed with cancer, I felt very alone. I had nowhere to go and no-one to talk to other than close friends and family. I often had to hold back as I didn't want to worry them. I have now found Maggie's and have been amazed at what a difference these centres make. I wish that I had access to them at the beginning of my cancer journey." Megan's breast cancer diagnosis came out of the blue at a time when she felt physically at her best. "Breast cancer has left me with a body that I don't recognise or love any more. I am now learning to accept the new me. Taking part in Maggie's on the Runway is helping me claim back the person that looks back at me in the mirror every day." Mandy lost her beloved sister and best friend Susan who had a brain tumour whilst she herself was undergoing treatment for breast cancer. "Susan is my inspiration and motivation for doing this. I know that she will be right by my side every step of the catwalk." Suzanne was diagnosed with triple negative breast cancer first in her right breast in 2016 and again in her left breast in 2017. Following surgery, chemotherapy and radiotherapy, Suzanne is now getting her life back on track. "Maggie's Manchester has helped keep me sane during the last couple of years. It has provided me with a sanctuary in my most vulnerable moments."